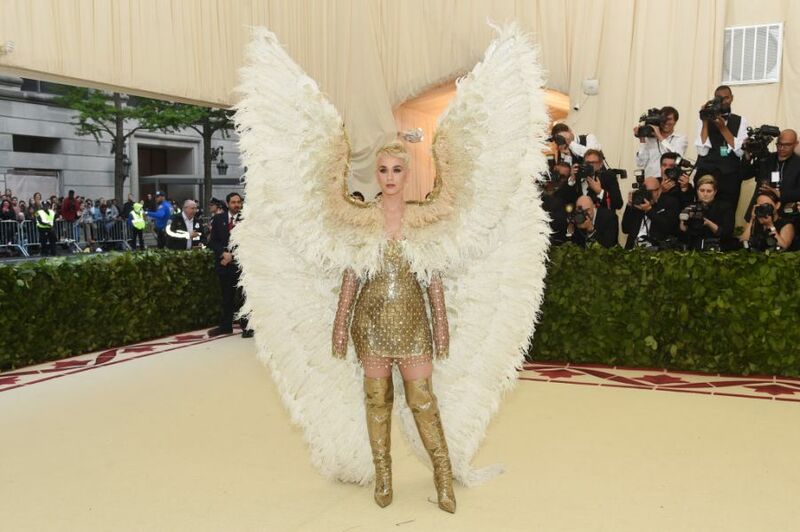 Another year and one of the biggest fashion night is here, the Met Gala and this year's theme was "Heavenly Bodies: Fashion and the Catholic Imagination." The Met Gala like every year is held on the first Monday in May, and one of the reasons to not miss the update of thie event is celebrities showcasing their gorgeous customes based on the theme. 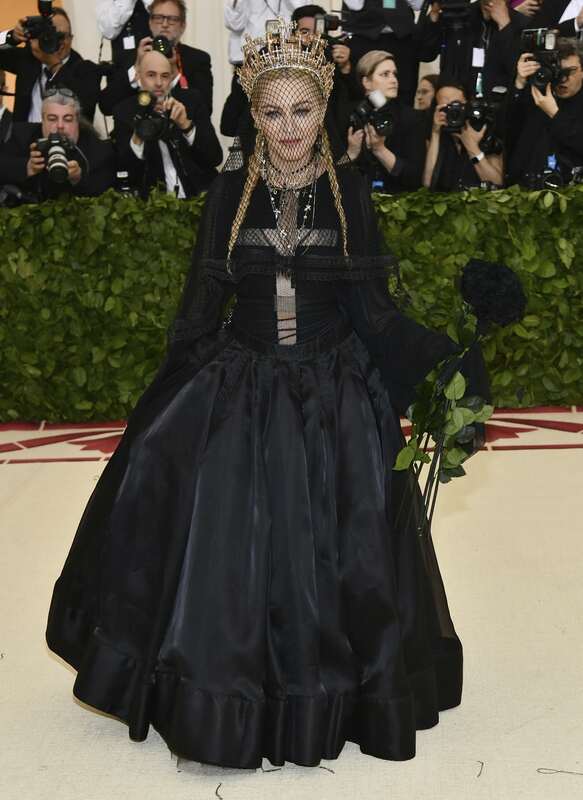 The Met Gala 2018 was hosted by by Rihanna, Amal Clooney, Donatella Versace, Anna Wintour and Stephen and Christine Schwarzman. And, guess we all know what to expect. Okay, so in awe of all the gorgeous designer and their art pieces donned by the celebrities, I have chosen the best of 7 out of the endless ethereal costumes worn at the exclusive event. You got to agree with me, Blake Lively shook the red carpet with a stunningly gorgeous rich embellished burgundy custome Versace gown dress with an embroidered skirt. I am totally star-struck with that dress and the person wearing it. A full 10/10 for Queen Blake. For me, she takes home the winning trophy for the best dressed celebrities this Met Gala 2018. My next favorite is definitely the Diva Rihanna, she sure knows how to bring the house down, and slayed the red carpet(Yet again). She is wearing a pearl encrusted, papal-inspired costume by Maison Margiela, a Christian Louboutin Shoes. Keeping the theme alive, Rosie outfit was an epitome of an angel who looked flawless and divine. The model, actress, and former Victoria's Secret Angel wore an ethereal caped Ralph Lauren gown. And, one thing that caught my eyes was the literal halo headgear which was just everything. She sure is an Angel. Kim K walked the ramp solo sane Kanye West wearing a chainmail Versace dress. The gown featured a crosses embroidered on the hip and bodice. It was teamed with a double chain necklace, a Cleopatra- like makeup with super long hair extension. No doubt, she is a goddess herself. 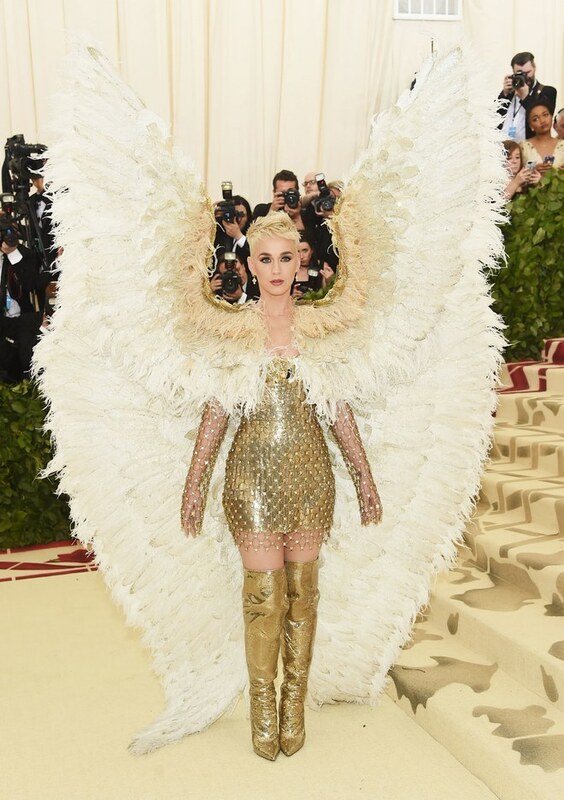 The singer made a head-turning moment with her super gorgeous angel-like wings that stole the red carpet moment with that huge feathery costume . She wore the pair of angel wings with a gold Versace gown and matching thing-high booths. She looked divine. I see you agreeing with me! 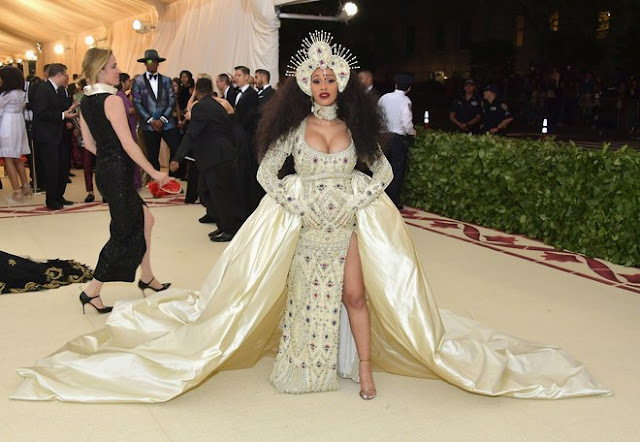 This is Cardi B's debut to the grand Met Gala and the 25 years old rapper happened to sly it. Her gown was a skin thigh silhouette with a gorgeous intricate details designed by Moschino, which accentuated her baby bump. Not to miss out, but her stunning detailed headpiece is what a queen like her should be wearing. Last but probably not the least on my list is Ariana Grande. Inspired by the ceiling of the Sistine Chapel at the Met Gala, Ariana donned a Vera Wang gown screen-printed images from Michelangelo’s Iconic painting, ‘The Last Judgement.’ I personally loved the details of the dress where the famous image of Jesus Christ taking the prime placement on the bodice. 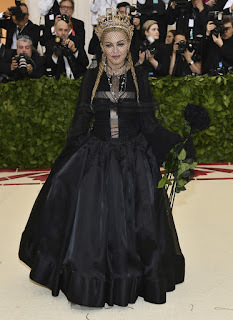 This is not only her first Met Gala, but also her first red carpet moment ever since the May 2017 incident in Manchester, England where a suicide bomber killed many inside the arena following her performance. So, there you go, My personal best #7 outfits picked from the Met Gala 2018, I would have surely loved to share more of it but I had to pick just 7. Let me know your favorite outfits from the Met Gala red carpet which you can add to this list.